If you are wondering how would it be to spend time indoors while running, then the NordicTrack Commercial 1750 Treadmill might be the solution you are looking for. Most people are quite busy nowadays, so they don’t have enough time to go to the gym or to spend some quality time jogging in the park. NordicTrack Commercial 1750 Treadmill will come in handy for every customer that doesn’t want to neglect the physical activity required for a healthy lifestyle. What is the NordicTrack Commercial 1750? This new home-gym asset is called the NordicTrack Commercial 1750 Treadmill NTL14115 and it comes with a 3.8 CHP MOTOR Train which is designed to be run quietly and safely, while boasting a very long lifetime. This type of engine has dual cooling fans, which ensure that the treadmill generates less heat and vibration. In addition, consumers will benefit from a better experience thanks to the DurXTM Commercial Pro 3.8 continuous horsepower motor. The unique feature of the NordicTrack® motors is that they are equipped with a built-in grounding brush which makes the motor run longer while also providing high-grade insulation. The incline can be adjusted between 0 to 15 percent in order to diversify training programs, which can vary from moderate to intense. This adjustment can be made by the user just by touching a button. Compared with its previous models, the NordicTrack 1750 has a 22” X 60” TREAD BELT is a significant step forward because the user will benefit from a safer product and enjoy a quieter workout. This belt makes the Commercial 1750 produce less friction and noise, so the consumer will no longer be stressed by any annoying sounds or vibrations during workout. Moreover, this belt is built to remain deck-centered and it is resistant to stretching, thus markedly improving the overall quality of the Nordic track 1750. Nordic commercial 1750 is designed for easy cleaning and maintenance, while also providing the user with considerable storage space. The SPACESAVER® DESIGN Innovative SpaceSaver® technology has an EasyLiftTM Assist telescoping shock. As the name implies, this shock helps consumers to lift the deck of the Nordictrack commercial. Another valuable feature is that the speed levels can be adjusted between run, jog, and walk, in a 0-12 MPH range, with just the touch of a button. Also, the handlebars have Dual CardioGripTM heart rate monitor sensors, which can establish the user’s heart rate quickly and correctly. 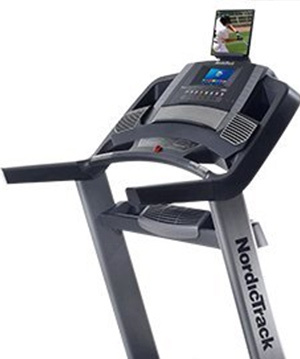 NordicTrack Commercial 1750 can be used with the 38 WORKOUT applications, which include various built-in workouts developed by experienced personal trainers. These workouts can be used by every customer based on the purpose of the training program. To sum up, workout programs for this product include many features such as speed, incline, heart rate control, calories consumption, and a user weight capacity of up to 300 lbs. Let us first discuss the main features that highlight one of the top-rated treadmills on the market. The equipment has a silent but powerful motor. It has a skip-free interval training and is durable enough for long distance runs. The touchscreen control panel of this machine is impressive. It has a 7″ touch screen as the control center. Aside from displaying workout programs, the full-color HD display lets you hook up on the latest news, check emails, and check what is trending on social media during exercise. The NordicTrack cushioning is very useful for competitive runners that want to simulate the running surface with outdoor conditions. When this is activated, the physical shock of activity will reduce. The automated incline settings that range from -3 to +15 percent, and the console buttons let you can adjust the slope whenever you want. The machine is also one of the easiest foldable treadmills available. It can be stored upright to maximize your rooms and measures 72.25″ L X 34″ W X 61″ H when folded. And finally, one of NordicTrack’s best feature is the monitoring system. The wireless chest strap transmits a constant reading to the console that helps you exercise in your optimal exercise zone. Also, you can obtain the results of your heart rate by pressing the sensors on the console. The NordicTrack Commercial 1750 Treadmill NTL14115 can be price checked and purchased from Amazon. Until the NordicTrack Commercial 1750 sale becomes available for every customer, the product can be added on the list. 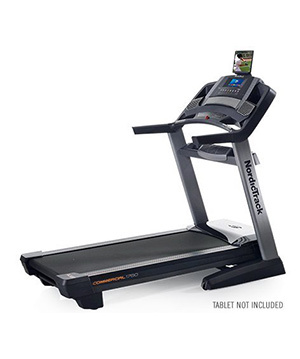 NordicTrack Commercial 1750 has programs that can be used in various ways by all users depending on their fitness goals. The latest version of the NordicTrack Commercial 1750 features 39 workout programs, all of which are developed by personal trainers. The product is also available with iFit, an app based on paid membership subscription which allows users to access Google Maps. In other words, you will be able to set a virtual route to benefit from customized health tips, and to chart your fitness progress as well. According to the manufacturer, the iFit can be connected to the home wireless Internet. This way, the user can download any personalized workout program developed by certified trainers. Besides Google Maps routes, iFit has many interesting videos. Experts recommend people with knee problems to use a minor incline when exercising, so as to shift their body weight forward and relieve some of the pressure on the knees. The rollers and the belt will last longer with less maintenance thanks to the material of the belt, which has a special lubricant that boosts the drive system’s longevity and performance. The NordicTrack Commercial 1750 has a 2-year Labor Warranty, a 5-year Parts & Electronics Warranty, and even a Lifetime Frame & Motor Warranty, so customers may rest assured that they will benefit from the best services in case they are not satisfied with the product. After a general NordicTrack Commercial 1750 Treadmill review, the product is indeed better than previous models when it comes to some technological features. Still, it is also true that the NordicTrack Commercial 1750 is far from being perfect but this treadmill even has a lifetime warranty. So, if the features of the product do not meet the requirements of the customers, they won’t be able to call it a lost investment. There is no ideal or perfect product that can satisfy the needs of every consumer because the market is so diverse and because people have different preferences. The NordicTrack Commercial 1750 can be either an unsatisfying or an excellent product based on the customer’s tastes and demands.